Growing up in the rural Valley of a Thousand Hills in KwaZulu-Natal, all Michael Mbanjwa and his friends could do during weekends was play soccer. Every Saturday on their way to soccer, they would cross a bridge where they saw white people with light boats in the dam. "At the time I thought it was just another white thing," Mbanjwa said. He didn't know anything about a sport called canoeing and never thought that one day he would be a champion of the sport. Canoeing, he discovered later, was when one or two people paddled a light boat called a canoe. 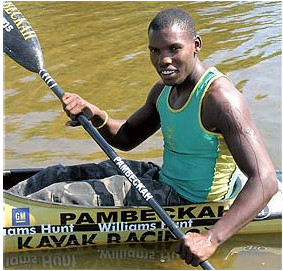 Today, Mbanjwa (24) is a top-rated and respected professional canoeist who has won several medals. His latest achievement was winning the Gold Medal at the famous Dusi Canoe Marathon. He was the first black person to finish second in this 120-km event. It takes place every year in January along the Dusi River between Pietermaritzburg and Durban and is one of the biggest and toughest canoe marathons in the world. who used to canoe in the dam, there was also a young black canoeist called Robert Lambethe. He asked us if we wanted to take part in the sport, "Mbanjwa said. "We were very interested in the boats and Lambethe started training us seriously." In 1999, Mbanjwa registered with the Natal Canoeing Union and started taking part in small races. He did his first Dusi in the same year and finished among the first 300 competitors. "I was very motivated and I trained hard. In 2000, I made the South African team that competed in England and Canada. My second Dusi was in 2001 where I finished 47th in the overall results and third in the junior section. "At the time I was doing my Grade 12," Mbanjwa said. After matric, he got a lucky break when Vodacom sponsored him with a R22 000 boat. 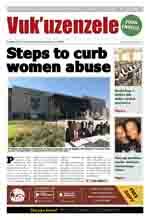 In 2004, he was asked to coach children from the East Rand townships at the Kayak Club in Benoni. "I am now a full-time canoeist," Mbanjwa said. More than five companies are sponsoring him with things like boats, money and cars. "I am very happy with my career and what I earn. I drive a sponsored car and I get money from my sponsors."